Most economists would answer A or B. Imports have not been treated seriously as a cause of job loss during the Great Recession. 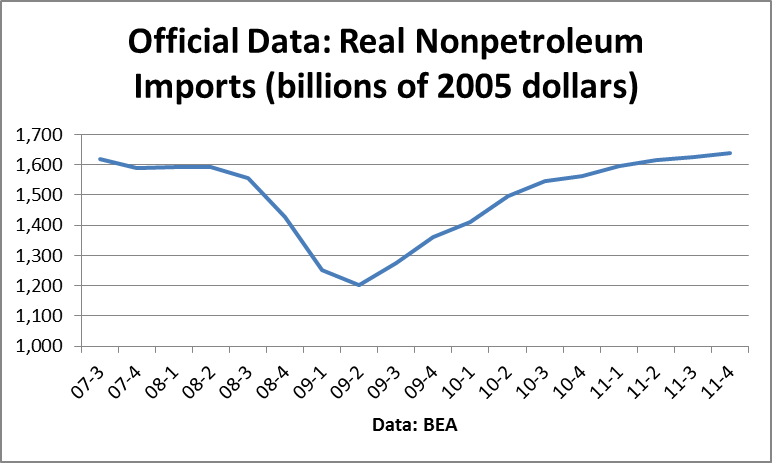 The reason is simple: According to the official date, real nonpetroleum imports are barely back to their pre-recession levels. You can’t have job loss from imports if imports aren’t rising. But two new studies from PPI show that the official data is wrong about the behavior of imports. We properly adjust for the economic impact of low-cost imports from countries such as China, and find that real nonpetroleum imports did rise from 2007 to 2011 by some $131 billion (in 2011$), instead of being basically flat. As a result, we estimate that 1.3 million jobs have been lost to rising imports since 2007. That accounts for almost one-third of the private nonconstruction job loss between 2007 and 2011. Markups of 20 to 50 percent on products like leather shoes and polo shirts have sent Western buyers scrambling for alternate suppliers…..Already, the slowdown in American orders has forced some container shipping lines to cancel up to a quarter of their trips to the United States this spring from Hong Kong and other Chinese ports. Yes, I know that sounds weird after all the manufacturing jobs that have been lost. 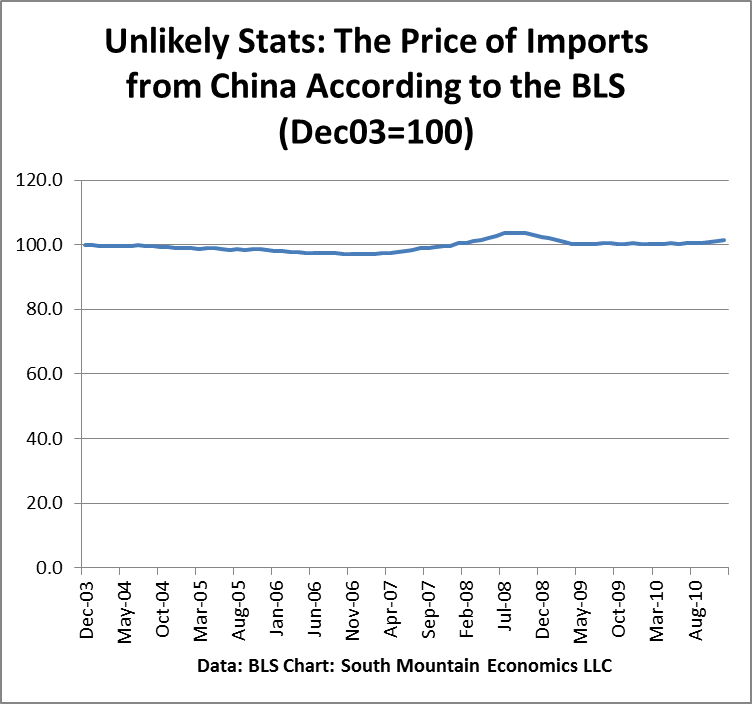 Anecdotally, the price differential between China and the U.S. was on the order of 35%. Given the price jumps in the pipeline, all of a sudden the cost of U.S. production might be in spitting distance for some industries.That’s especially true since domestic manufacturers have the advantage of being close and flexible. * The BLS does not measure the difference between the price of imports and the price of the comparable domestic goods. Just doesn’t. Never has. It’s a gaping hole in the data. *The BLS does measure changes in import prices–but very very badly (see here and the conference proceedings here). To understand how badly, take a look at this chart, which supposedly tracks the price of Chinese imports. Each month the BEA releases figures for personal income and disposable personal income. These figures are a mix of private sector income and money received by individuals from the government. These government payments take the form of wages paid to government employees, and social benefits such as Medicare and Medicaid. So I decided to take a shot at calculating ‘private’ personal income. From personal income I removed government social benefits (about $2.1 trillion in 2009) and wages paid to government employees (about $1.2 trillion). Then I added back in contributions for government social insurance, such as Social Security and Medicare payroll taxes (just under $1 trillion). Finally, I adjusted for inflation and population size to get a figure for real ‘private’ personal income per capita. Here’s a chart of the 10-year growth rate of real private personal income per capita (the first quarter figure for 2010 is based on the average of January and February). Over the past decade, real private personal income per capita has fallen at a 0.2% annual pace, the first time that has happened since the Great Depression. Let’s compare this with the usual figure quoted by economists, real disposable income per capita. Real disposable income per capita–which includes government wages and social benefits, and adjusts for tax changes–rose at a 1.2% rate over the past ten years. In other words, when we add in government spending increases and tax cuts, real incomes per capita rose rather than fell. The logical conclusion is that the private sector has been crapped out for the past ten years. Even before the crisis hit, the main thing that kept the economy afloat was the succession of Bush tax cuts and the expansion of federal spending which boosted benefits, particularly in healthcare. This was a bad bad decade. I finished up my tax return this weekend. I did it myself, using Turbo Tax, and ran it by our new accountant (because I left BusinessWeek in 2009 and started a new business, the return is more complicated than in previous years). Now that’s done, I can take a look at the bigger tax picture. Just for fun, I calculated total taxes paid by Americans as a share of national income. Total taxes includes federal, state, and local income taxes, corporate income taxes, property taxes, sales taxes, social security and medicare taxes, and every other kind of tax (except for the estate tax). The top red line tracks total taxes as a share of national income–in effect, the average tax burden for the whole economy. In the fourth quarter of 2009, the average tax burden for the whole economy was 27.5%–the lowest since 1966. That shows the combined effects of the Great Recession and the tax cuts. If we leave out social insurance taxes, the trend is even stronger–the average tax burden, omitting social insurance taxes, is the lowest in the post-war era. These calculations are similar to the ones done by the Tax Foundation in its calculation of Tax Freedom Day, the day where Americans have “earned enough money to pay this year’s tax obligations at the federal, state and local levels”. Take a look at the Tax Foundation’s chart. 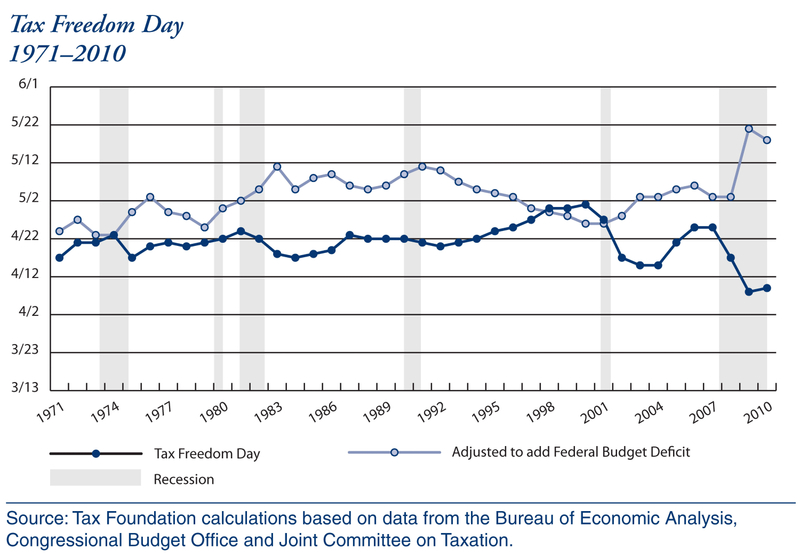 In fact, Tax Freedom Day is earlier now than it’s been in the past forty years, suggesting that the burden of taxes is lower. The question, then, is why is there so much opposition to tax increases. Part of it is the distributional question–the average tax burden and Tax Freedom Day both measure the average over the whole economy, rather than for any individual. But more important, I think, is the pervasive weakness in the private economy, which makes the burden of taxes feel heavier. I’m going to write more about this.